Does the thought of holding a garage sale give you goosebumps or cause you to break out into a cold sweat? Garage sales were an annual event during my childhood. My mom thought they were fun and would select household items throughout the year to set aside for the summer sale. My tips will help you run a profitable and organized sale. 1. 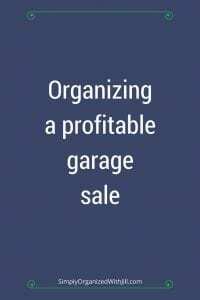 First and foremost, do you enjoy hosting garage sales? Think about it. Only do it if you are ready to work hard. I’ve determined they aren’t for me. 2. Do you have plenty of big-ticket items? Large items will draw in someone who may otherwise do a drive-by looking for good stuff. 3. How will you get the word out about your sale? Does your neighborhood have an annual garage sale? If so, they usually coordinate advertising (for a small fee) and the event will draw more traffic. 4. Price everything and organize it on tables according to the category of use. For example, tools on one table and kitchen items on another. 5. You’ll need small change. Stock a cash box or a waist/fanny pack with $1’s, $5’s and quarters. 6. Determine the amount of time you want to devote to running a sale. Most of your traffic will occur early on the first day of your sale. 7. Tidy your garage. A rainy day could mean you have to move the sale indoors. 8. Lastly and most importantly, what is your plan for the items you have left? Do not bring them back into your home. Arrange for a charity to pick the items up. Let me know if you enjoy hosting garage sales or prefer the ease of donating your excess?